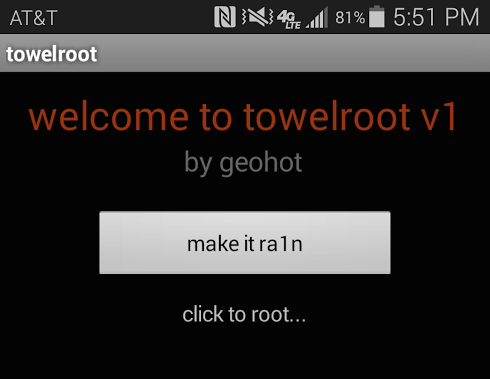 The name might be more familiar to those carrying iOS devices than Android, but the man they call Geohot has just released his yet another Android rooting app, called ‘towelroot’ for Samsung flagship Galaxy S5. Made available to download from towelroot.com for free, but with plenty of requests for donations, the new root tool is first to root Verizon and AT&T versions of Galaxy S5. 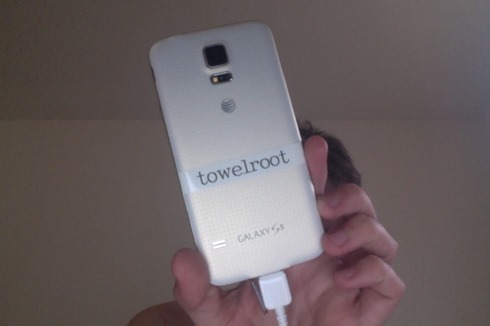 According to Geohot, towelroot is compatible with both the AT&T and Verizon Samsung Galaxy S5 models, but in reality it should work perfectly fine with anything that’s running a kernel built before June 3. The Samsung Galaxy S4 Active, Galaxy Note 3 and Nexus 5 should be good to go too, should you own one of those and have a hankering for a new root tool. Installation of the root-gaining app is nice and simple. After heading on over to the tool’s website on your device, simply tapping the lambda will download the required APK directly on your Android device. Install and then run it. Tap on the famous “make it ra1n” button and magic ensues. Soon after that, you’ll be rooted. It’s a kind of method that feels familiar to those who enjoy a good browser-based iOS jailbreak every once in a while, and keeps things as simple as can be. It is important to note that this is not the first time Geohot has released an Android rooting tool. He has also been the first to release Samsung Galaxy S4 Active root tool. On the subject of iOS, it was not that long ago that Geohot tried to sell his iOS 7 jailbreak for over a quarter of a million dollars. If he’s going to re-enter the iOS jailbreaking arena, he’s got some making up to do after that botched jailbreak sale that left a bitter taste in many mouths. Got the opportunity to test ebay to uｎｌｏｃｋing my iphone 5, all was seemed fine but after it was only great for two weeks than was bricked.It was quite unlucky or i was stupid to use them? No i probably could not beleive that sht i tought.. Than i found a post on twitter There were fineThat was the really best selection i want to use ATiPhoneuｎｌｏｃｋing, the phone they’ve revealed for me is functioning since 4 months without issues. I bet they know what they performing in the view of iphone uｎｌｏｃｋing. There’s a denial of access for many cheap սոⅼοсkings with the AT&T data base, that makes most of the 3rd party ՍΝᏞΟᏟΚing sites incapable of սոⅼοсking AT&T anymore. However, you can find still sites that can do the job, just google atttiphoneuunloockiingis one of us, go check it out, it’s the site I have already been using for 6 of my phones following the database shut down.